Search Results for "shampoo boy"
UNITED STATES: 1950s: Boy in shower runs fingers through his hair. 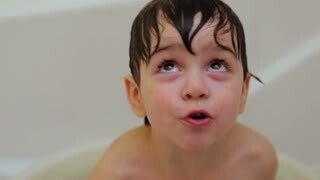 Boy puts shampoo in his hair as he takes a shower. Close up of boy's head as he rubs in shampoo. Boy rinses off shampoo in shower. Hairdresser hand wash children head and hair of little boy with shampoo in barber shop. Close up washing head to boy in kid hair salon. Children hairstyle concept. Children hairstylist washing hair with shampoo to little boy in barber salon. Close up wash children head in barber shop. Male hairdresser washing head to little boy. Kid hair care concept. UNITED STATES: 1950s: boy in shower rinses shampoo from hair. Lady sits in chair. Lady talks to camera. UNITED STATES: 1950s: Boy in dressing gown smiles as he checks that bathroom is left clean and tidy. Bottle of shampoo next to bath. Tap turned off in bath. Clean sink and plug in bathroom.